My husband Tyler and I believe that when a vacation is over, depression sets in and the only way to cure it is to book your next trip. Right after our honeymoon (we went to Spain, Morocco, and Germany), we booked a trip to Iceland for six months later. While we were in Spain during our honeymoon, we met two Norwegians (Chris and May) through my cousin who is Norwegian and became fast friends. They have also experienced this vacation depression and on their last day we were discussing traveling together. 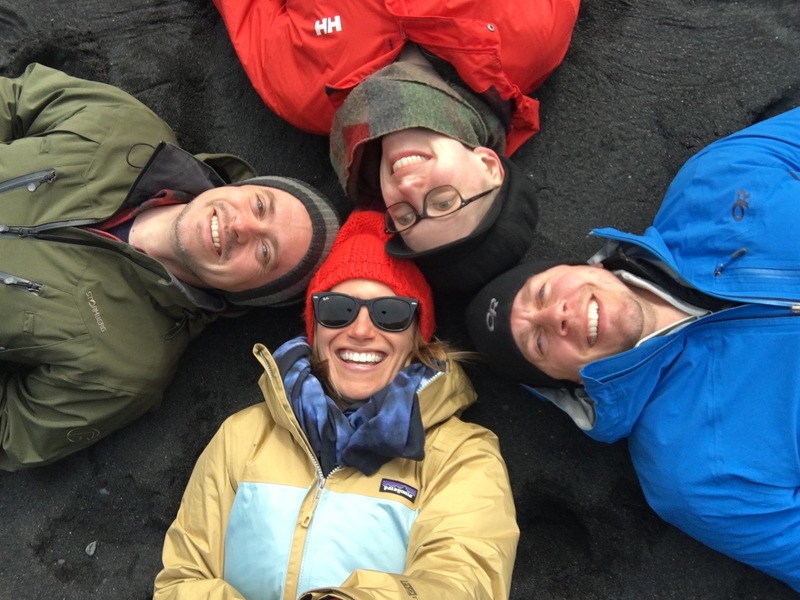 We said, “We should go to Iceland!” Fast forward to the week Tyler and I got back from our honeymoon, we messaged Chris and May and said we are ready to book our trip and did. Tyler is an incredible trip planner, so once we purchased the plane tickets, I sat back and let him get to work. His itinerary was incredible. Each day was filled with an adventure, relaxation time, and not too much time in the car. We landed before Chris and May and picked up our wifi (highly recommend getting this) and the rental car. The car rental service in Iceland explained to us, that you need to hold your door as you exit your car. I took it with a grain of salt thinking it was odd, but after the first gust of wind that almost took my car door off, I realized they weren’t joking. So, I repeat, hold your door and also don’t have everyone in the car open their doors at once…the winds are that strong! 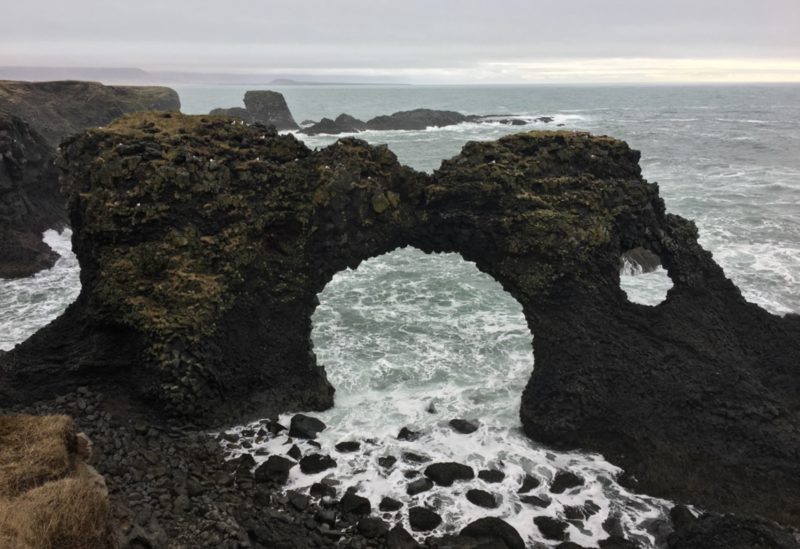 Once we made our way to Reykjavík, we took a free walking tour (just pay tip). Our tour guide was Eric and he was so full of knowledge about Reykjavík and Iceland, that it was the perfect way to start the trip (and fall in love with the country). 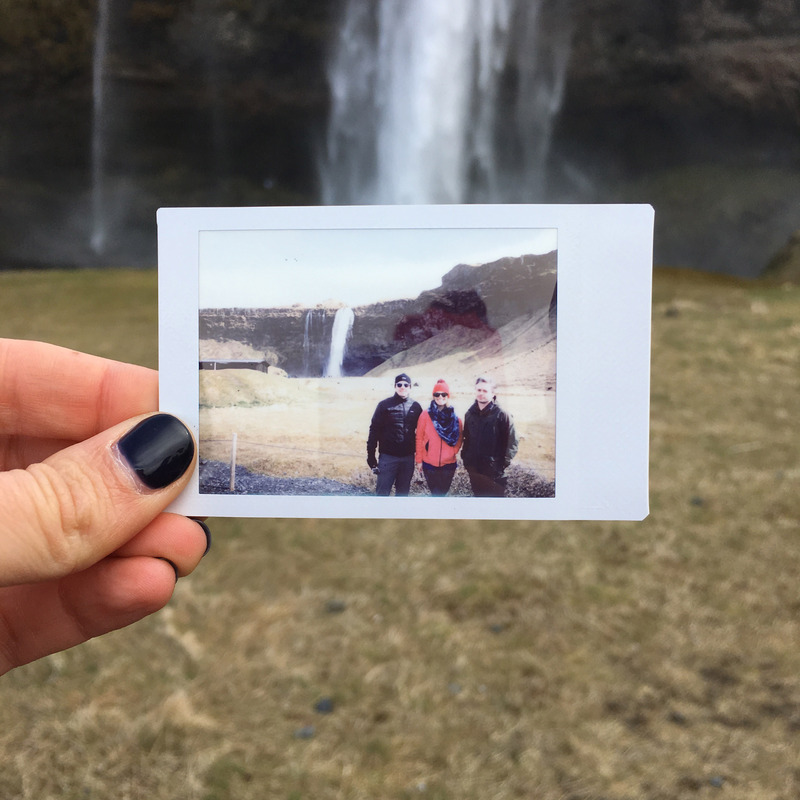 We walked around for two hours learning about how peaceful Iceland is, how progressive Iceland is and how equality is one of their main goals. They are actually the first country to have equal pay for men and women. They have 63 senators with 30 of them being women. They don’t have an army (only three Coast Guard ships), no guards at their “White House”, and about one murder a year. Plus, during their Pride parade, up to 100,000 people participate. That’s one third of the whole country (338,000 people live in Iceland total). 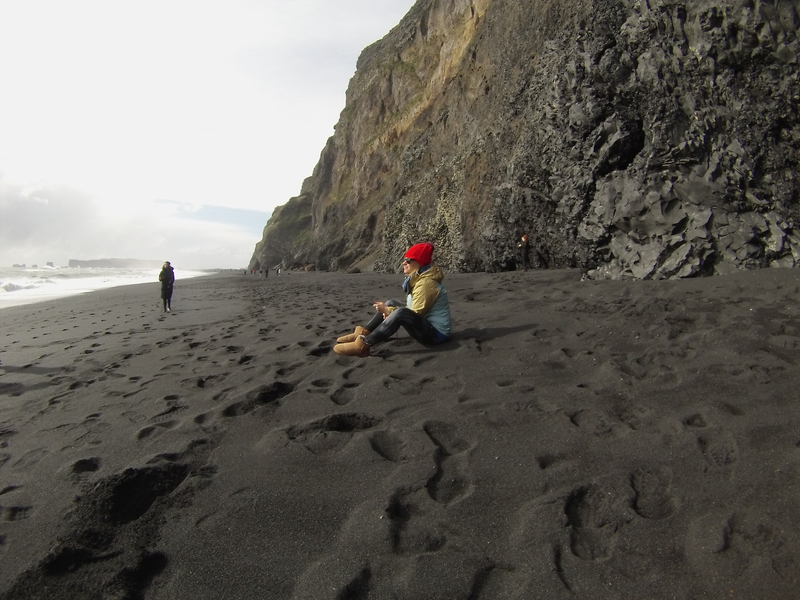 Needless to say, I fell in love with the peaceful, safe, happy culture that is Reykjavík and Iceland as a whole. After freezing our butts off while walking around, soup was needed. We made our way to Sægreifinn (also known as The Sea Baron) because they claim to have the world’s best lobster soup…and they do. This tiny, hole-in-the-wall place has three communal tables and a front patio. We ordered the famous lobster soup with skewers of cod. The soup is rich, full of flavor and served with a basket of bread, which you will want to be able to sop up every last drop. The cod is fresh (probably caught that day) and cooked to perfection. 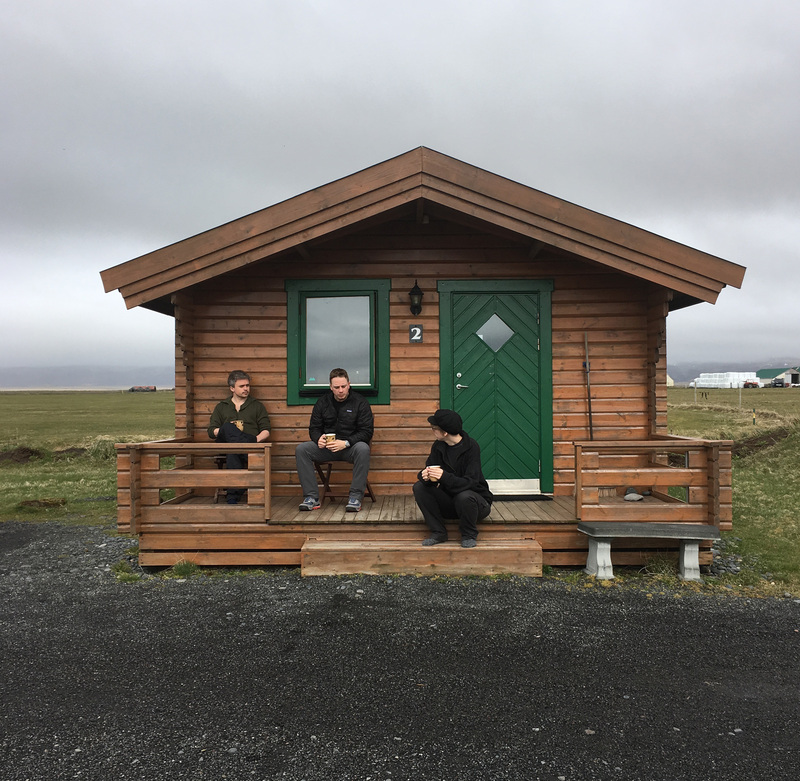 From there we checked into our Airbnb, and went to the airport, got Chris and May and headed back to Reykjavík to settle in and find a spot for dinner. We landed on Messinn, which I suggest you makes a reservation. We were lucky that they could fit us in. This rustic spot serves up a great wine list, cocktail list, and incredible seafood in cask iron skillets. Tyler and I split a Salmon skillet which came with parsnips, cashews, broccoli, coconut oil, chili, and lemon. We also ordered the skillet of roasted vegetables with cous cous. Everything was incredibly fresh and delicious. Plus, they had vegan, and dairy free options as well. 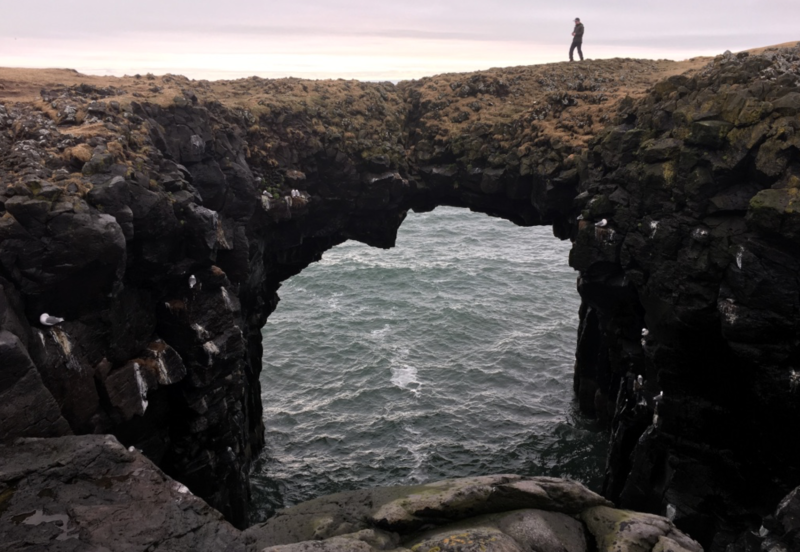 The next morning, we bundled up and headed to see some of Iceland’s incredible National Parks while driving the “Golden Circle.” Our first stop was at Thingvellir National Park, which is the only place in the world that you can see tectonic plates meet. 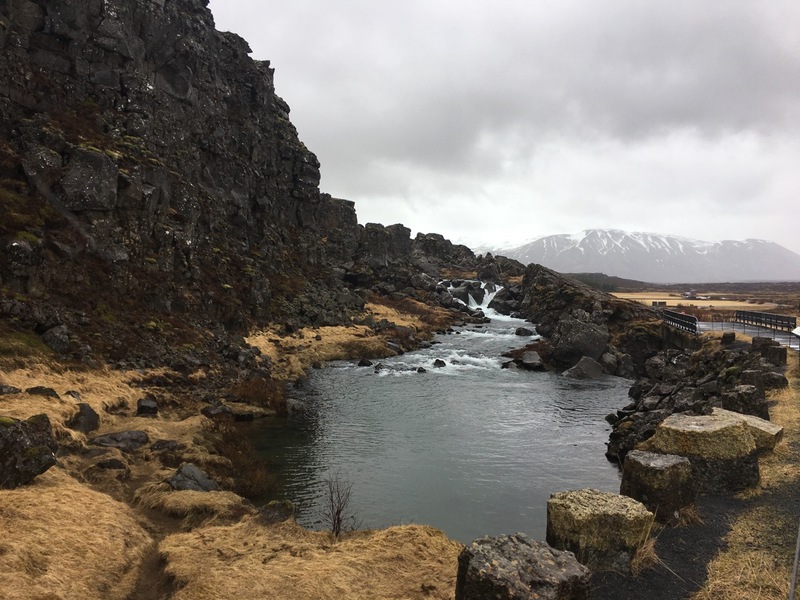 Walk in between the North American and European tectonic plates, while taking in the incredible sights like the Oxarafoss waterfall and Drekkingarhylur pool (some if may look familiar from Game of Thrones). From there, we headed to the Haukadalur geothermal region to see the Strokkur Geysir. We were at the geysir for about two minutes when it shot up in the air and took me by surprise. It’s pretty amazing that something natural is perfectly timed (every eight minutes) and has such a force. Last on our sights, was the Gullfoss waterfall. The waterfalls in Iceland truly make waterfalls in California seem like a trickle. 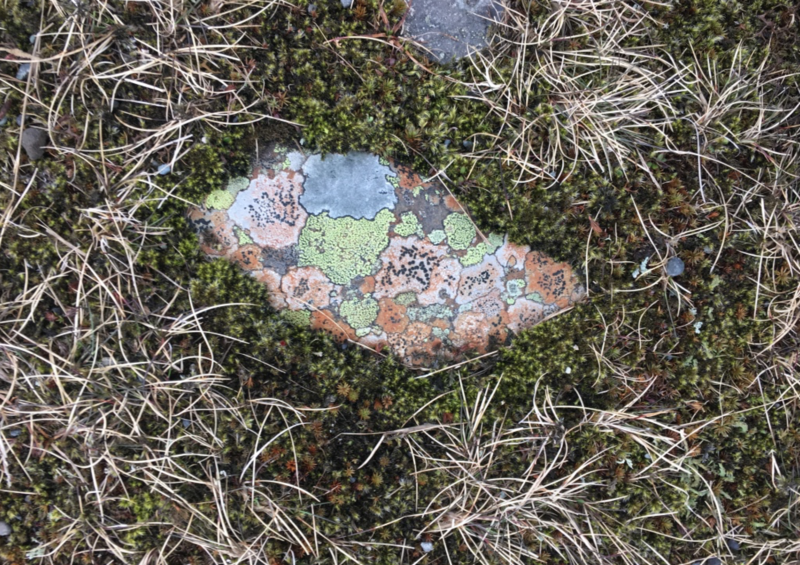 It was a day filled with nature’s beauties that were unlike anything I have ever seen. 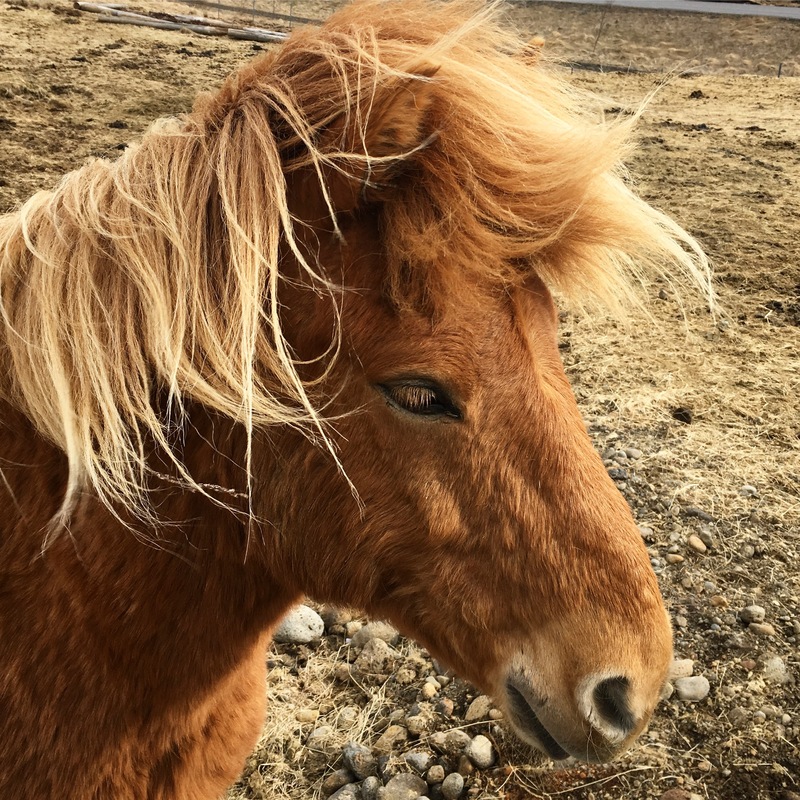 We piled back in the car and headed back to Reykjavík, but had to stop to say hello to some Icelandic horses on the way. They are smaller and furrier than American horses and you will see them all over the country. That night we stumbled into The English Pub when it started to snow. As we waited for a table, we ordered some beers at the bar and found that they only served Icelandic beer. I quickly found a stout that was my new go-to staple. Once we sat down, we ordered the meat soup, lamb burger, hot dogs and fries. 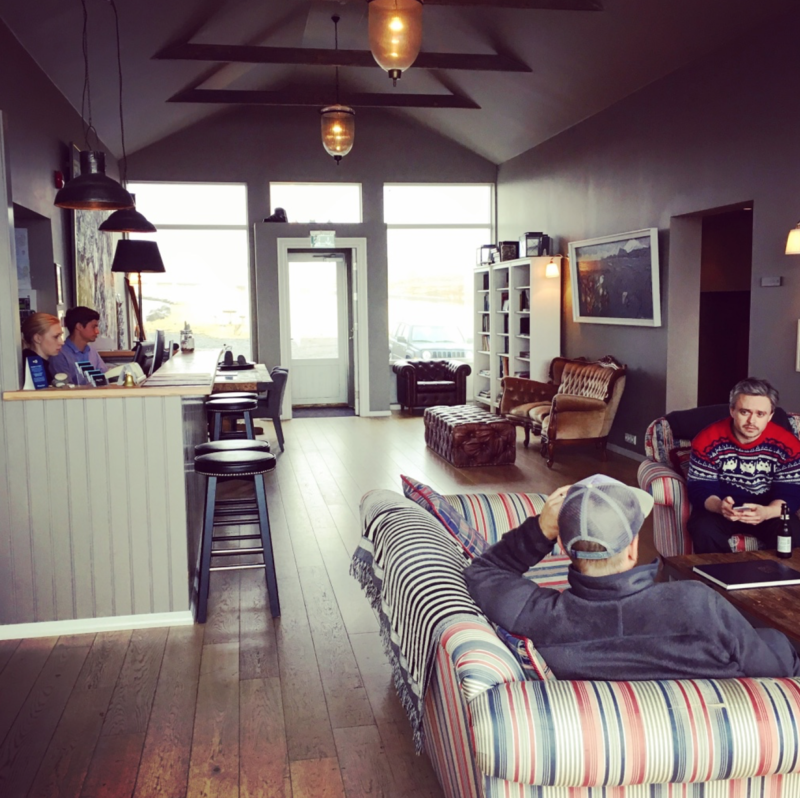 It’s a great spot to warm up, grab a beer, and some good ol’ Iceland food. Tyler even said it was one of the best burgers he ever had. From there, we headed to The Lebowski Bar…yep a whole bar based on the movie, which we are huge fans of. With twenty different White Russians, a bowling alley on the wall, and a rug that really pulls the room together, this bar did not skimp anything from the movie. We loved it so much, we went back later on in our trip too. The next morning we headed to Vik, Iceland, which is on the west coast. 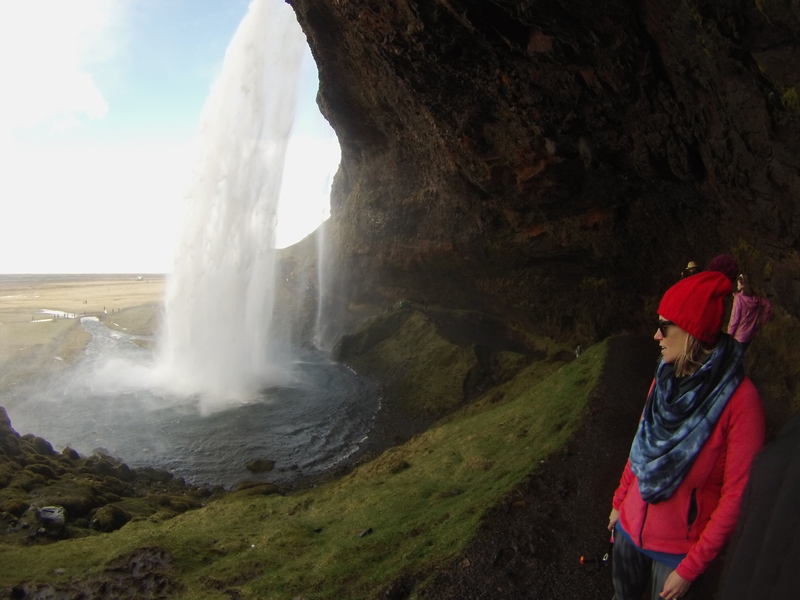 On the way, we stopped at the Seljalandsfoss Waterfall. You are able to walk around and inside of this gorgeous waterfall. 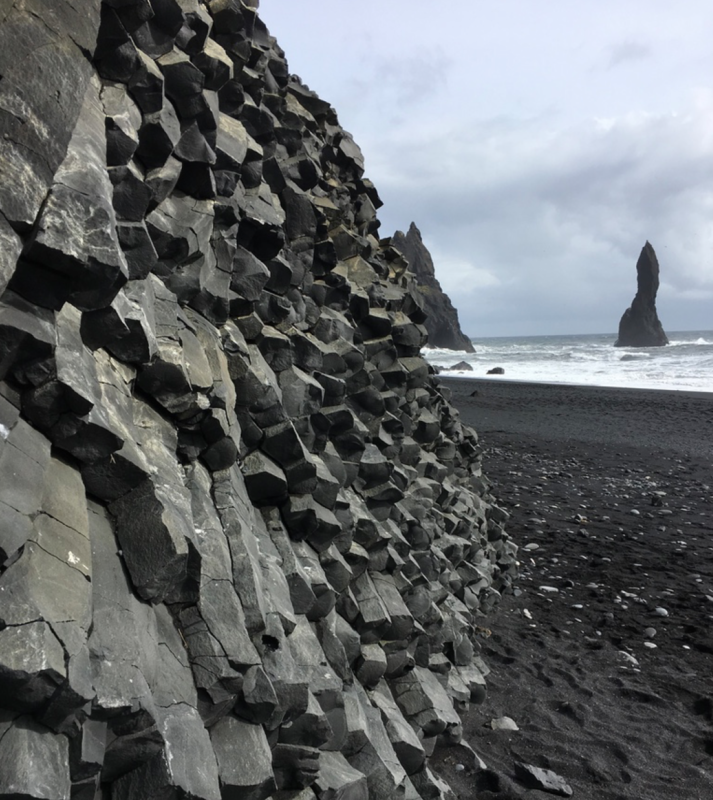 From there we headed to the Black Sand beach and Reynisdrangar sea stacks. We were warned to not touch the water, which we tried to not laugh at, but once we saw the “Sneaker Waves” we realized it was no joke. The pull and the frequency of the waves was more intense than we had ever seen. Even more eye catching, was the black sand that was such a contrast to the water. We checked into the Mid Hvoll Cottages that are six cottages situated on a farm in the middle of nowhere. It’s completely off the grid. Each cottage had everything you need…pots and pans, furniture, bathroom, and sleeping arrangements for up to five people. We cozied up while May cooked a delicious dinner, and chatted until late in the night. The next morning we had to take advantage of the warmer temperatures and had coffee on the porch while we chatted with the owner about the storm the night before. The winds were so strong, that we thought it was going to take the roof off of the cottage. The owner was extremely friendly and happy. I loved how she was so content with such a simple life on the farm. It is so different than living in Los Angeles. We headed to Glacier Lagoon for the day. It was a little bit longer of a drive than we expected, but worth it. As we pulled up to the blue pieces of ice, we all were speechless. The lagoon filled with light blue pieces of glacier was one of the most beautiful sights I have ever seen. 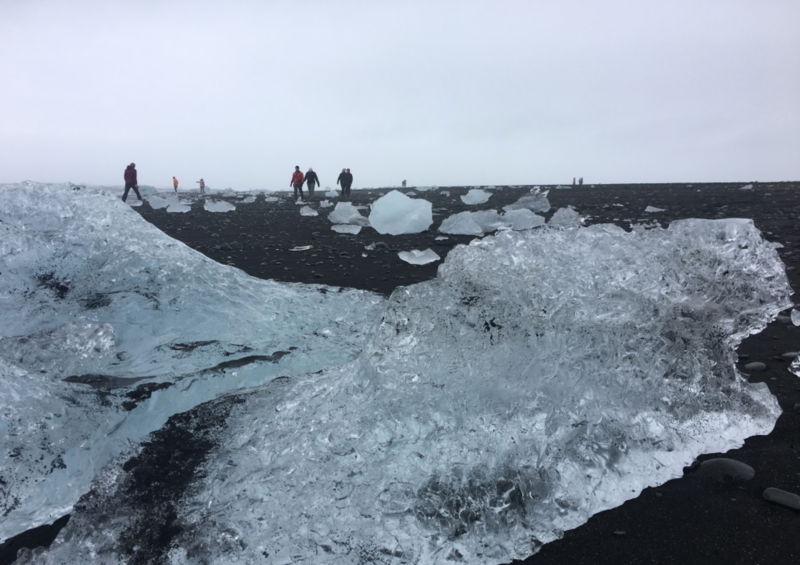 Across the road was Diamond Beach, where pieces of blue ice laid along the black sand and created a contrast that looked like something from another planet. It was truly breathtaking. 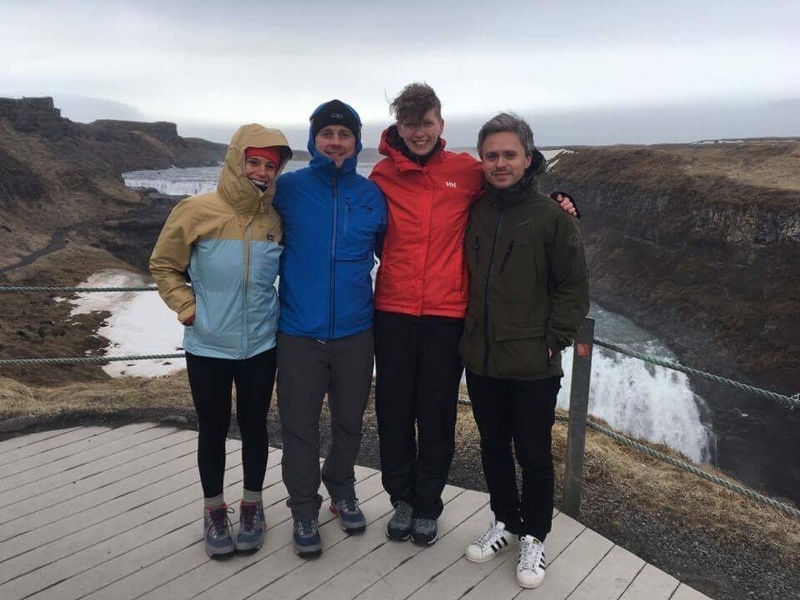 On the way back to Vik, we stopped at Vatnajokull National Park for a little hike. 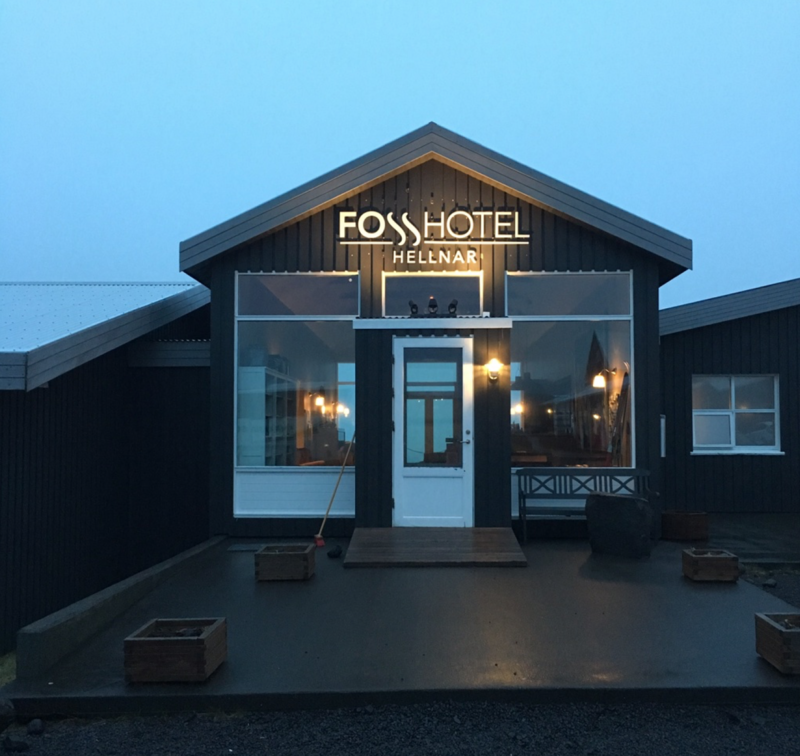 That night we ate at Suður-Vík Restaurant and had incredible cod and lamb. For a city that has a population of about 300, everyone must have been at the restaurant because the place was packed. The food was fresh, the wait was short, and the views were of the sea stacks…what more could we ask for. Happy and full, we headed back to the cottages. 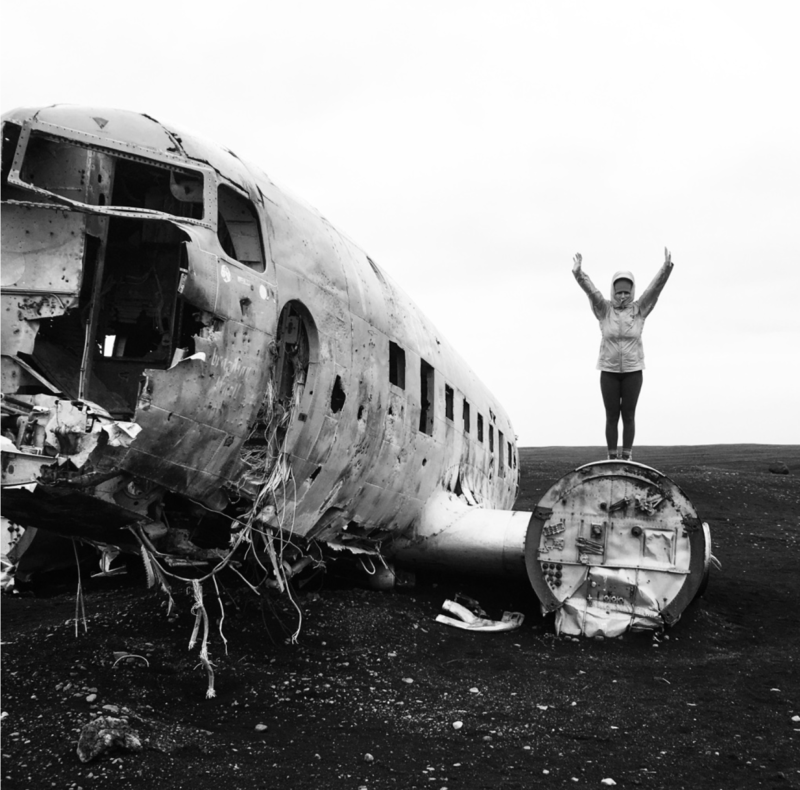 The next morning the wind was brutal as we walked the 45 minutes to the 1973 U.S. Navy Plane wreck. 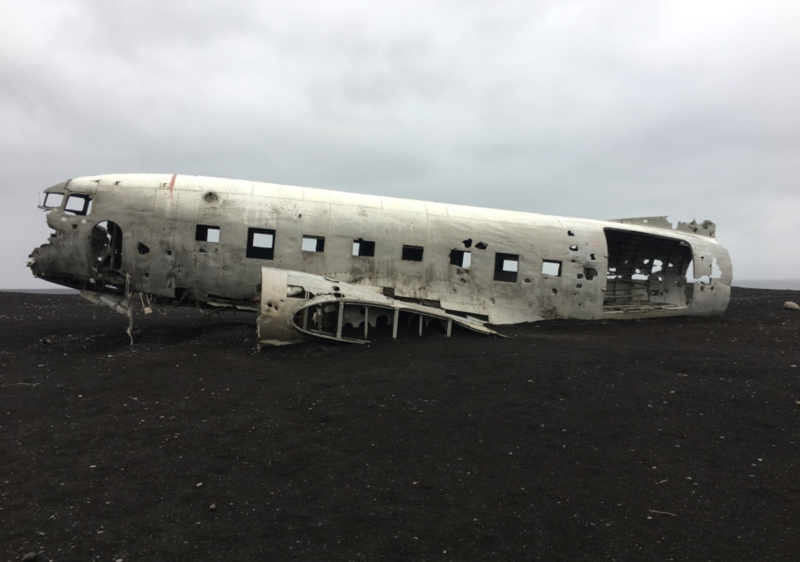 We came upon the grey plane sitting against the black sand and it was just an amazing sight. 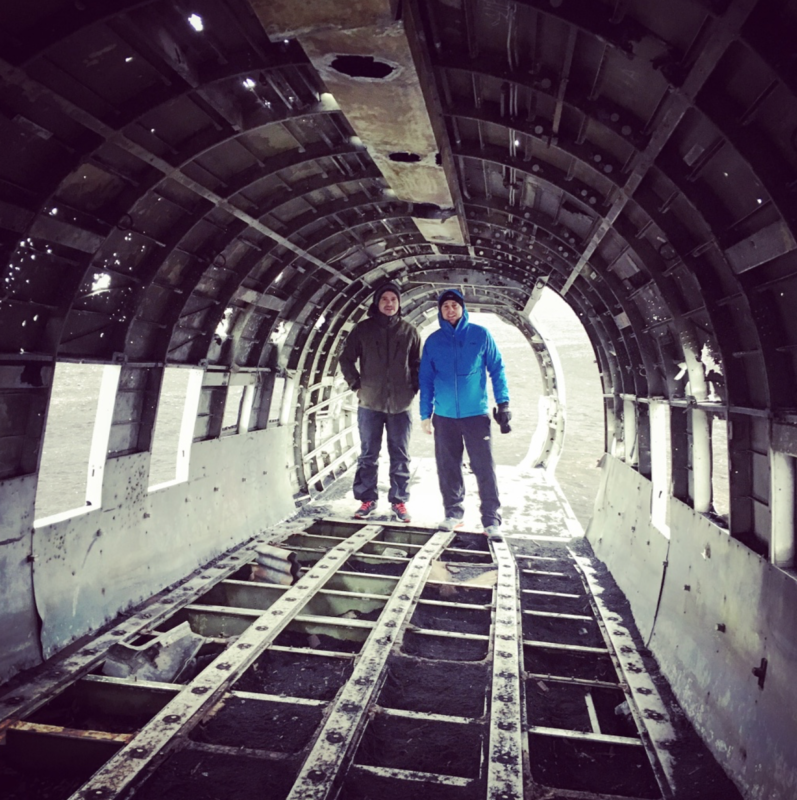 You were able to crawl on top of it, inside of it, and take pictures. 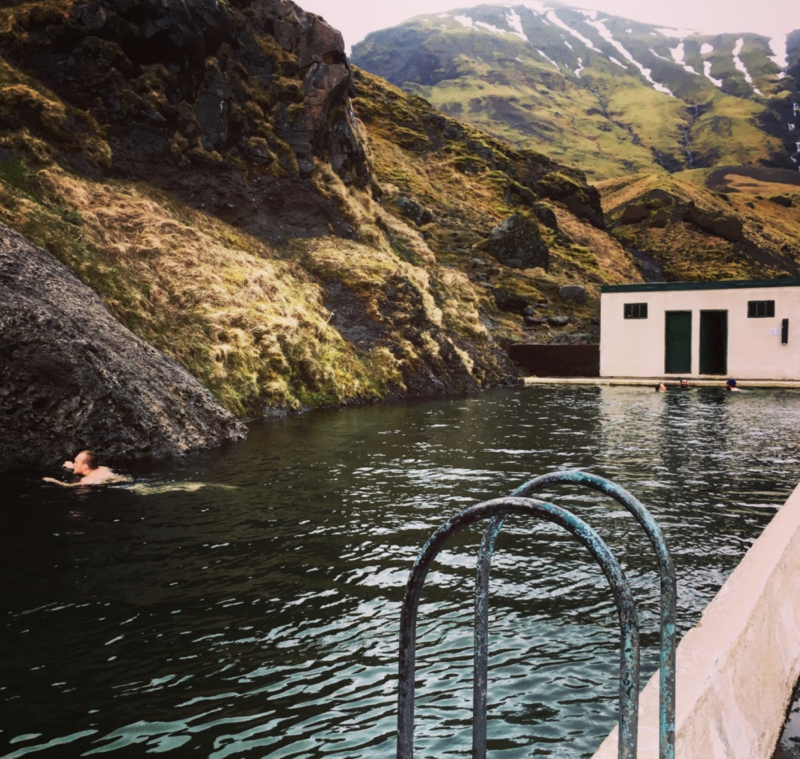 From there we did an impromptu stop at Seljavallalaug natural hot springs, which is Iceland’s oldest public pool (public pools are a thing here). The river was strong that day, so to get there, we had to take off our boots and walk through the freezing river. I can’t describe to you the pain and how my feet felt walking through that water. I think I am still waiting for feeling to come back. The pool itself was hidden in the middle of the mountains. It was beautiful, but it wasn’t warm enough for me to get in there. From there, it was back to Reykjavík for the night. The next morning, as Chris drove May to the airport to head back to Norway, and Tyler and I walked around the city. We met up with Chris and stopped by Baejarins Beztu Pylsur, the hotdog stand made famous by Bill Clinton. Clinton stopped by and said it was the best he had ever had and the rest is history. I don’t know the last time I had a hot dog, but the Icelandic hot dogs are made from lamb and were pretty delicious. I had mine with the works…onions, fried onions, ketchup, mustard, and mayo (they love mayo here). 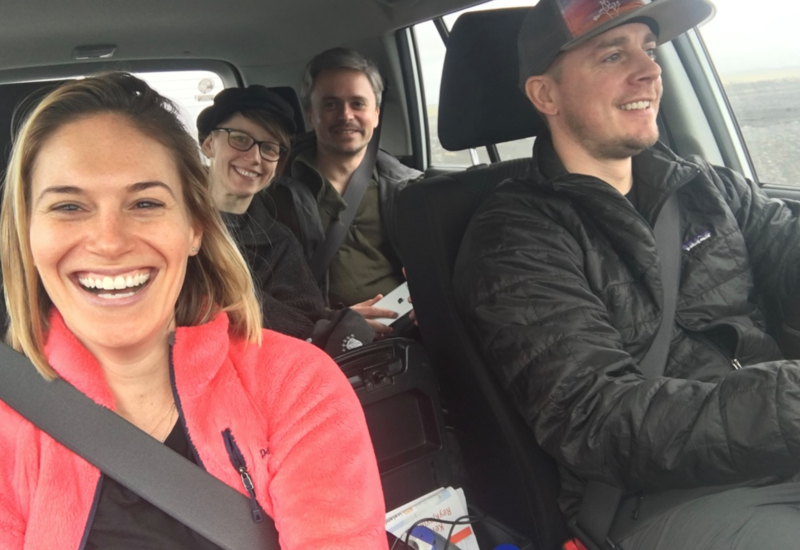 With full bellies, we hopped in the car and headed to Snaefellsjokull National Park, where we hiked a little bit and then headed to Hellnar for the night. With a population of ten right on the ocean and the only thing really “happening” is the hotel we stayed in, Hellnar is unlike any place I have been. The Fosshotel was a luxury from all the Airbnb’s we stayed at. The lobby was comfortable, cute and we hung out there for most of the night. We had originally booked two rooms, but since May had to leave early, we asked for one room with a cot. They were so generous and upgraded us to a bigger room for no charge. That night we had dinner at their restaurant and it was some of the best food we had all trip. 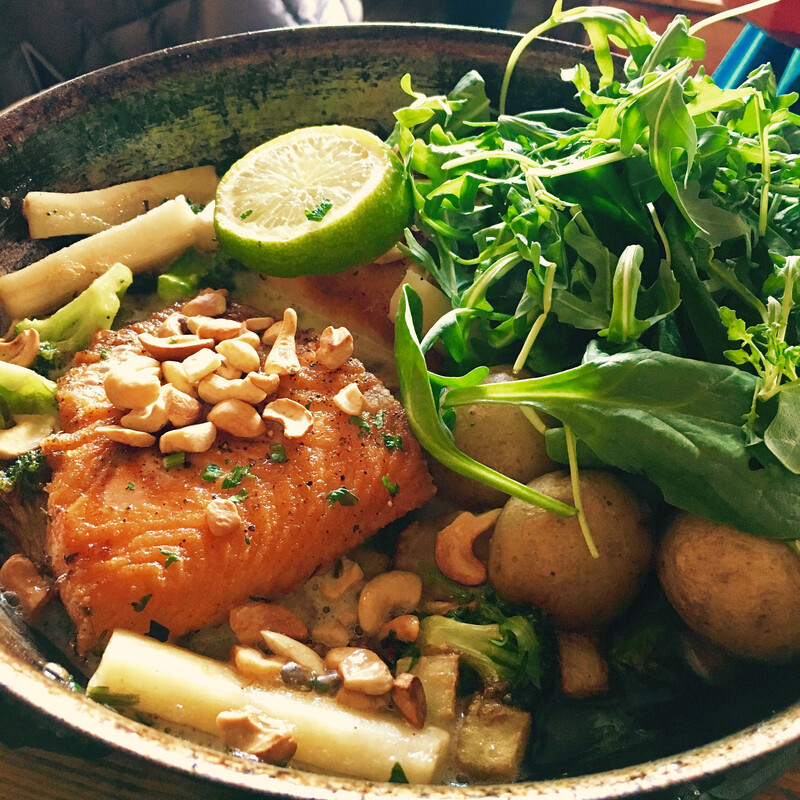 All restaurants in Iceland have fish soup, but this restaurant did not disappoint. It was rich and creamy with fresh fish. We also tried the scallops, cod, and lamb, which were equally as tasty. The next morning, I was up at sunrise and went outside to take pictures of Hellnar’s old church. At 4:30 am, no one was around. It was exciting to explore the town and I found a cemetery that sat next to the hotel. 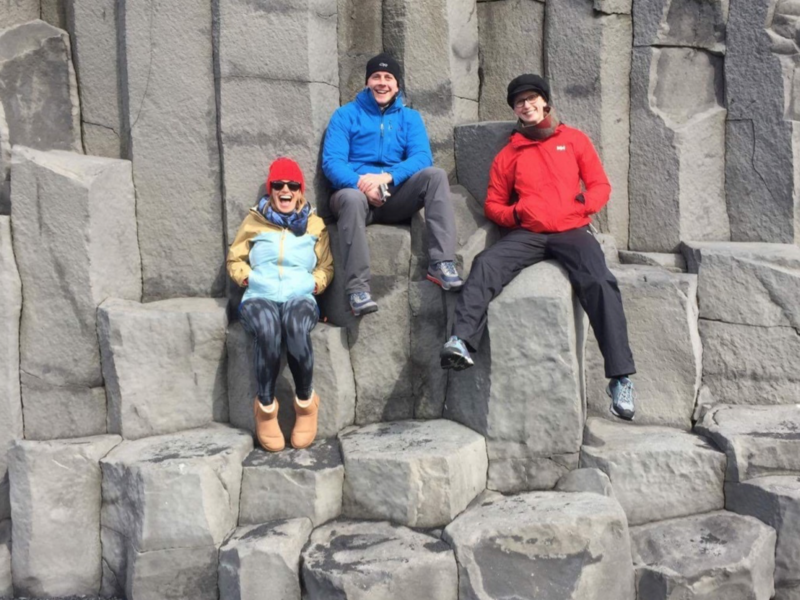 On our ride back to Reykjavík, we stopped in Arnarstapi to see Gatklettur, the most famous rock formation in that area and continued to Kirkjufell Mountain and Kirkjufellsfoss, which was beautiful, but shaded from the fog. 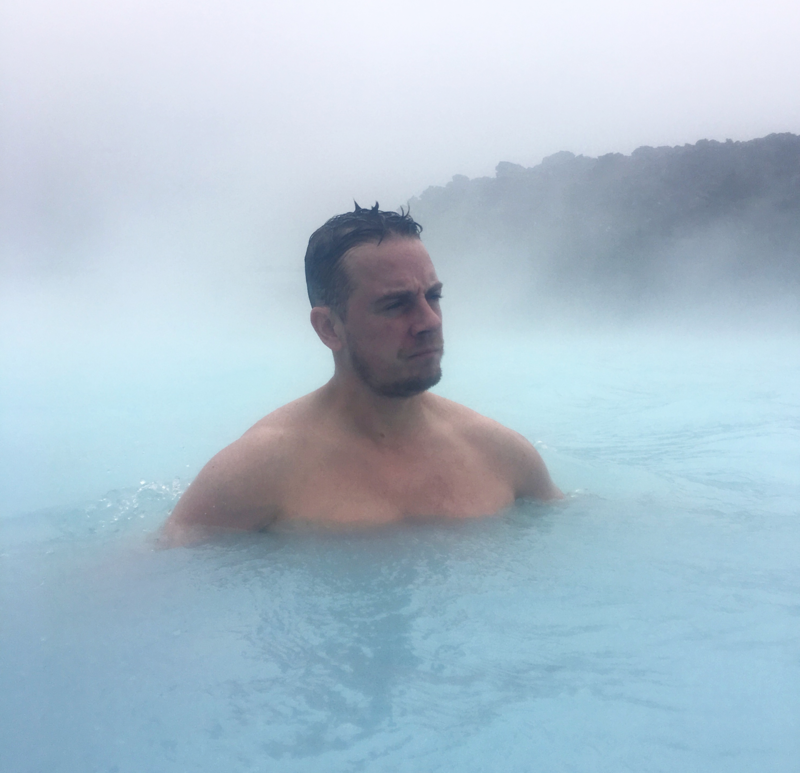 Then, it was full speed to the Blue Lagoon. 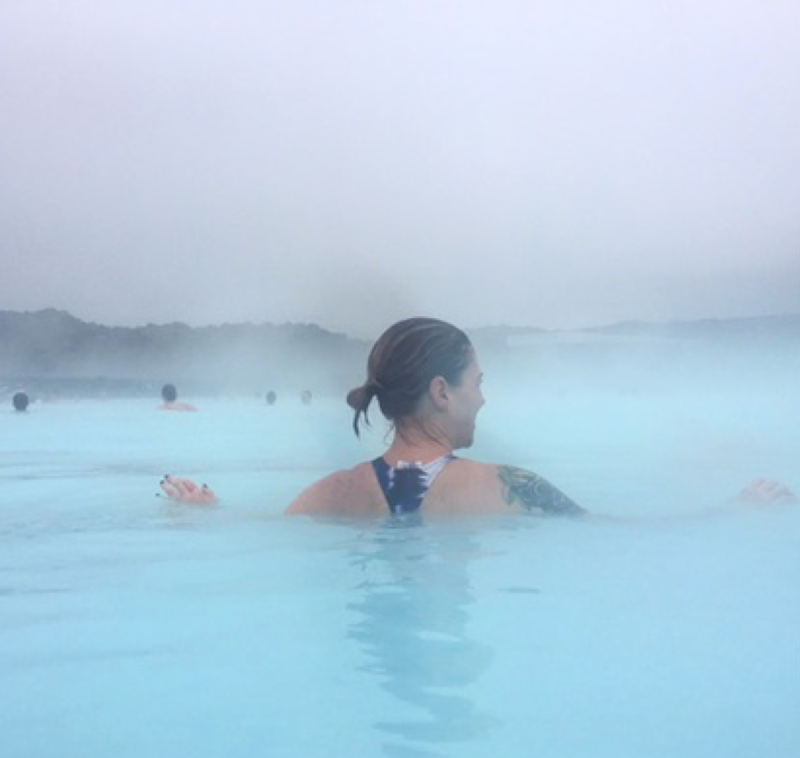 As you pull up to the Blue Lagoon, there are small patches of bright blue water and the smell of sulfur lingers in the air (it’s from the volcanic rock heating the water). Inside, we each received a waterproof wrist band that serves as payment and we made our way into the locker rooms. After a quick shower (it’s required) and slathering on the hair conditioner to save my hair, I met the boys to get into the hot water (It ranges 94-104 degrees Fahrenheit). Even though the lagoon was busy, it’s so large you don’t feel overwhelmed. We swam up to the bar, got a couple drinks and made our way to the face mask booth to get our silica masks. There is also a cave to relax in and a sauna. After about two hours in the water, we rented towels, got another drink and headed into the locker room to clean up for dinner. We ate at Lava Restaurant, which is part of the Blue Lagoon and ordered the lobster soup and the lamb. The lobster soup is a must order and overall, everything was delicious and hearty. It was perfect after a day of relaxing in the lagoon. 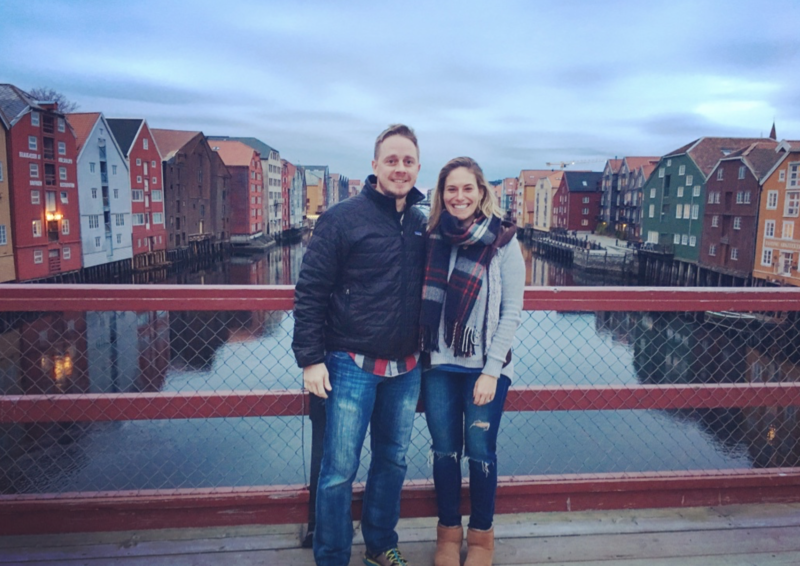 The next morning, we landed in Trondheim, where Chris and May live and quickly fell in love with the city. Trondheim is Norway’s third largest city, with a mixture of modern restaurants, historical areas, and cobblestone streets. Trondheim, is approachable and adorable. May gave us a tour through the old section, all along the river before dropping us off at her apartment to nap and meet up with her and Chris later on. 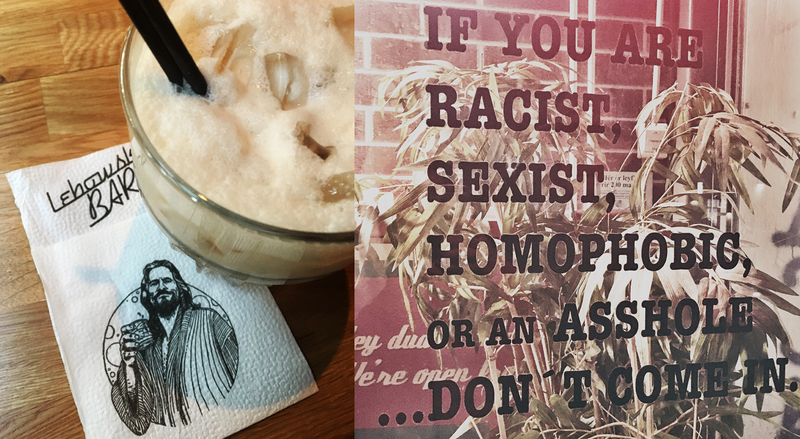 We started the night at Antikvariatet, a cozy and artsy bar filled with hundreds of books and plenty of beers/ciders. From there, we spent the night bar hopping, dancing, and meeting the locals. Rolling into bed at about 3:30 am, we all knew we would be sleeping in the next morning. 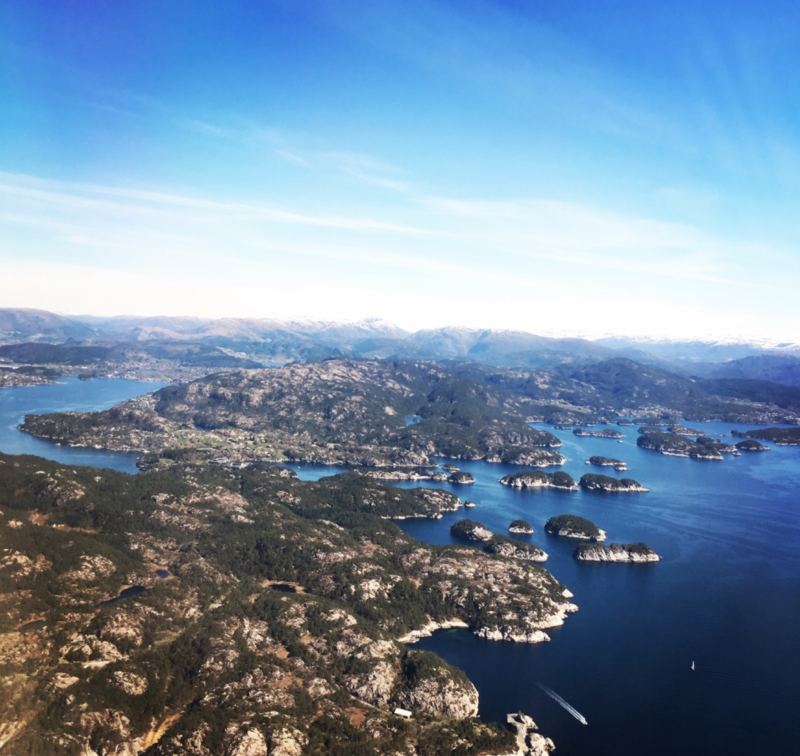 The next few days we explored the city including climbing to the top of the Nidaros Cathedral, eating at Egon, a rotating restaurant, and Sverresborg, a museum built around the ruins of King Sverre’s Castle which dates back to 1183. While visiting Trondheim, we started our day at Dromedar Coffee Bar Nordre, where I always ordered the Søt Chili…a spicy take on a mocha. We feasted at Havfruen, an elegant, modern restaurant with views of the river and the Old Town Bridge, which Trondheim is famous for. The fish was beautifully plated and perfect paired with unique vegetables. Our last day, we had lunch at Baklandet Skydsstation, which is more like your grandmother’s house, than a restaurant. Famous for their tomato based fish soup, we all ordered it. Piled high with fish, shrimp, and vegetable, I dove in and I still dream of that perfect soup on that chilly day.